The theory with ear acupuncture is that the ear is the same basic shape as the human foetus. Small fine needles which are attached to skin coloured surgical tape are inserted into four points that relate to parts of the body or bodily functions. 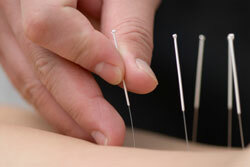 The needles are left in for a week at a time. The process works by pressing the needles as soon as you get an urge or craving which in turn stimulates the corresponding point and takes away the craving momentarily so you can get over the crisis period. The points of the ear that we use are: For Weight Loss:- will power and mind, the mouth, the stomach and the salivary and taste glands, for people having treatment to help quit smoking the points are the same except the stomach point is not used but one for the lungs is instead. If you are attending for weight loss your physiotherapist will ask you compile a food diary to outline where you can change your diet, if you are attending for smoking cessation your physiotherapist may suggest you start to cut down between the time of making the appointment and attending your first session. How much does Ear Acupuncture cost? The cost of ear acupuncture is £25 per session and a course lasts for 5 weeks, the final consultation being free. Group discounts are available upon request for groups of 3 people or more.